Morgan Estep is a Customer Service Representative. She began her career at Farmers Alliance on January 2, 2018. “My whole life has consisted of being on the back of a horse. From a young age I would ride around with my dad at his roping’s. My dad was actually the one who got me started in rodeo. He was in the rodeo scene when he was younger. 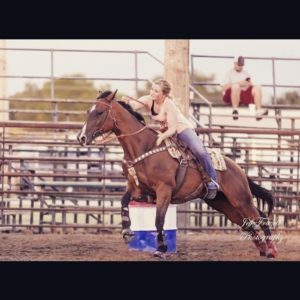 He competed in bull riding, saddle bronc and team roping. He actually participated in rodeo while serving in Germany. Now he decided to pass on his passion to me. I got my first horse when I was about seven years old. When I hit the age of ten I started competing in junior rodeos, amateur rodeos and 4-H. After my first competition I was hooked! Rodeo has taught me a lot growing up and I have made so many friends through it. Growing up I participated in the Harvey County 4-H horse project and qualified to compete in barrel racing, pole bending and the flag race for 8 years at the Kansas State Fair. I was also involved in the Heartland Youth Rodeo Association out of Kingman, Kansas and competed there all through middle school and high school and qualified for finals every year. In college I was a member of the Fort Hays State University Rodeo team and traveled all over Kansas and Oklahoma to compete against other schools. 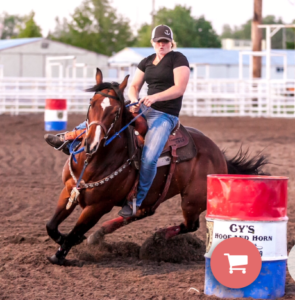 Now that I am out of college I travel around the area to different barrel racing jackpots and bought my membership to be a part of the Central Plains Rodeo Association and will be traveling to rodeos around Kansas to qualify for finals in October. My next rodeo will actually be held in McPherson, Kansas on June 22nd-23rd! Right now I compete on two horses. My younger horse I bought when I graduated from high school and have been training him on the barrel pattern. He is the bay pictured and his name is Cash. My other horse I am competing on is Tee J and he is the sorrel pictured. I had Tee J when I was in high school and decided to start getting him back in shape for the summer. Which I am glad I did because he has been getting me second place at all the jackpots I have ran at so far. Good luck Morgan during your rodeo season!